Rachel Dolezal announced Monday she's stepping down as head of the Spokane chapter of the NAACP. Rachel Dolezal, the controversial head of the Spokane chapter of the NAACP, announced Monday she’s stepping down from her post. Dolezal wrote in a Facebook post that the international attention surrounding her personal identity has overshadowed the work of the organization it’s in the best interest of the chapter to separate herself. Dolezal has become the focus of scrutiny and news stories worldwide since her parents revealed last week that she is white. The local civil rights advocate identified herself as black and appeared to change her hair and skin tone to look African American. 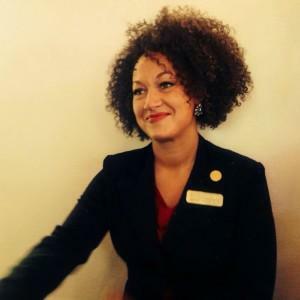 Local members of the NAACP called on Dolezal to resign over the weekend. Dolezal did not address the controversy in her statement, except to say the full story hasn’t been heard. She said she remains dedicated to civil rights causes. Dolezal had been viewed as a vocal leader who got the civil rights organization more involved with people’s lives. She got behind the Black Lives Matter movement and made that a local issue. But her image has changed drastically of course in the last few days, and now what we’re hearing is that there had been questions about her identity and who she was and how she was representing herself. Dolezal's bio has also been removed from the website of Eastern Washington University, where she taught Africana studies. A spokesman for the university said she had a contract that expired Friday. He couldn't say if she would be given a new contract.